Recent headlines are proclaiming that newly published data from the Centers for Disease Control and Prevention (CDC) show that firearm-related fatalities are at record highs. This makes for a catchy headline but fails to tell the real story behind the data. Thankfully, the CDC breaks down the data by unintentional fatalities, homicides, and suicides. This makes a careful review of the data possible — and such a review is revealing. Since 1999, the CDC data show that the number of fatal firearms-related accidents are, fortunately, down over 41 percent, even as millions more firearms have entered the market. The firearms and ammunition industry is proud of our safety programs and continues to strive for an even lower rate of unintentional fatalities. 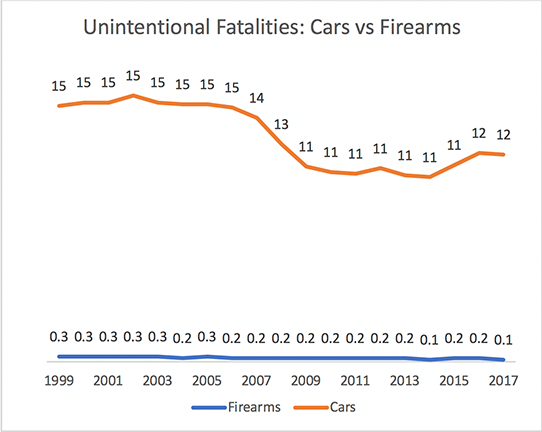 Likewise, it’s understandably confusing when recent news articles proclaim that “guns killed more people than car crashes in 2017.” While this kind of clickbait is sure to get views, it is a deliberately misleading comparison of different data. In this article for example, the authors take the full sum of all firearms-related deaths, suicides, homicides and accidents, and compares it to car accidents. Why not compare firearms accidents to car accidents? Well that would show that car accidents occur at far higher rates (11.9 for cars compared to 0.1 for firearms). As the chart below illustrates, this runs counter to the author’s pre-conceived narrative and makes for a terrible chart. The CDC data also show that homicides are flat, with other data sources pointing to a downward trend in violent crime. The firearms and ammunition industry applauds the increased prosecution of gun crimes under the Trump Administration and remains committed to our programs that help law enforcement to keep guns out of the hands of criminals. The sad truth is, about two-thirds of firearms-related deaths are due to suicides, and, according to the CDC, suicides are up in almost every state in America. While even anti-gun extremists would have a hard time arguing that gun control laws would prevent these unfortunate but intentional acts, some will point to discredited studies that attempt to draw a link between gun control laws and suicide rates. The fact is that there is no evidence showing a causal relationship between gun control laws and decreased suicide rates. Gun control laws do not offer a panacea for the real problem of increasing suicide trends in the U.S., but that doesn’t mean there is nothing that can or should be done to address this problem. The firearms and ammunition industry is dedicated to finding ways to keep guns away from those who should not have access. That’s why the industry continues to work with 15,000 law enforcement agencies to put gun safety kits, including gun locks, into more American households through Project ChildSafe. We have distributed more than 37 million locks to date. To further build on our long-standing efforts, the industry has partnered with the American Foundation for Suicide Prevention to help educate retailers, ranges and the firearms-owning community about suicide risk factors and warning signs, as well as options to safely store their firearms when not in use. The industry looks forward to continued declines in unintentional firearms fatalities and homicides and will continue to work for meaningful solutions to the suicide crisis in America. In the meantime, beware of clickbait articles that choose the convenient narrative over telling the full story of firearms in the U.S.